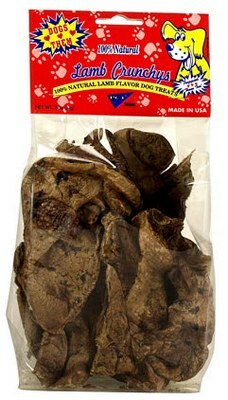 February 11, 2015 — Pet International of Miami, Florida is recalling 1500 units of its 6″ Beef Trachea Pet Treat because it may be contaminated with Salmonella. No illnesses have been reported to date. The company is still warning consumers that if any of the above information is on the package you have, do not feed it to any animals. It may be hazardous and should be disposed of immediately. The affected product was distributed to retail stores in the following Colorado Cities: Conifer and Lakewood. The recall was as the result of a routine sampling program by the Colorado Department of Agriculture and analyzed by FDA, obtained from Buster’s Natural Pet Supply in Conifer, CO. and found to be positive for Salmonella. The sampled product had a Buster’s label but was manufactured by Pet International. Buster’s Natural Pet Supply recalled the entire product from the two stores that the distributor sells it. Pet International Inc. continues their investigation as to what caused the problem. Salmonella can affect animals (i.e. dogs) eating the products and there is risk to humans from handling contaminated pet products, especially if they have not thoroughly washed their hands after having contact with the products or any surfaces exposed to these products. Consumers exhibiting these signs after having contact with this product should contact their healthcare providers. Dogs with Salmonella infections may be lethargic and have diarrhea or bloody diarrhea, fever, and vomiting. Some pets (like dogs) will have only decreased appetite, fever and abdominal pain. If your dog has consumed the recalled product and has these symptoms, please contact your veterinarian. If you have this product, use gloves and put in a double bag and throw it away as soon as possible. Do not touch the product in any way. However, if you do, it’s recommended to wash your hands immediately with an antibacterial soap. 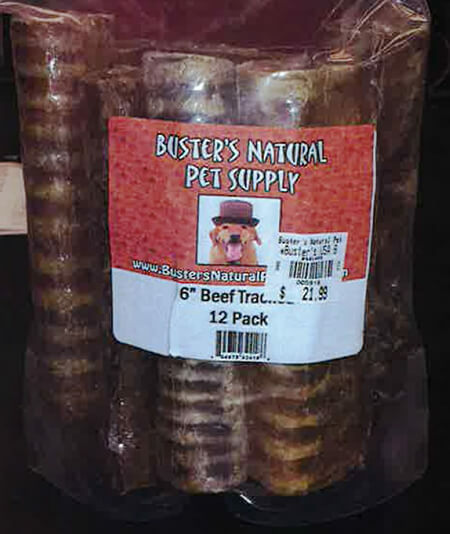 Consumers who have purchased 6″ Beef Trachea with Buster’s Natural Pet Supply Label on it and are wishing to be refunded because of the recall, can take the product back to where it was purchased (with receipt). A special form will be provided to be filled out as well. Both the form and the receipt are needed for the refund. Consumers with any questions about the recall product may contact the company by phone at 305-591-3338 Monday through Friday 9:00 AM to 5:00 PM EST or via e-mail at sergioh@petint.com. FOR IMMEDIATE RELEASE – December 31, 2014 – Jump Your Bones, Inc. of Boca Raton, Florida is voluntarily recalling Jump Your Bones brand name Roo Bites (Cubes) because it has the potential to be contaminated with Salmonella. No pet or consumer illnesses from this product have been reported to date. Healthy people infected with Salmonella should monitor themselves for the following symptoms: nausea, vomiting, diarrhea or bloody diarrhea, abdominal cramping and fever. Rarely, Salmonella can result in more serious ailments, including arterial infections, endocarditis, arthritis, muscle pain, eye irritation, and urinary tract symptoms. Consumers exhibiting these signs after having contact with this product should contact their healthcare providers. Pets with Salmonella infections may be lethargic and have diarrhea or bloody diarrhea, fever, and vomiting. Some pets will have only decreased appetite, fever, and abdominal pain. Infected but otherwise healthy pets can be carriers and infect other animals or humans. If your pet has consumed the recalled product and has these symptoms, please contact your veterinarian. The affected lots of Jump Your Bones Pet Treats were distributed to retail pet food stores nationwide and through pet food retailers/distributors. 63633010041 for 80g. / 2.82oz. including samples of .32 oz. Consumers who have purchased the above product of Jump Your Bones, Inc. pet treats are urged to stop feeding them and return product to place of purchase for a full refund or dispose of them immediately. For further information about the recall please call (888) 249-6755 from Monday – Friday 9am – 5PM EST. 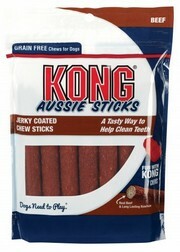 September 25, 2014 – Kong Aussie Sticks dog treats have been quietly recalled by the product manufacturer, JAKKS Pacific of Walnut, California due to possible contamination with mold. As of the time of this writing, neither Kong or JAKKS Pacific has posted any public information webpage giving specific details about this event. According to a letter obtained from JAKKS Pacific and forwarded by Kong to The Dog Food Advisor, the recalled product was sold only at PetSmart. No further store location, online sales or other distribution details have been provided by either company. We are troubled by the covert nature and lack of transparency exhibited by both companies associated with this particular event. And evidently they made no effort to post a public notice. The products were not dried properly so a small percentage of finished goods have gone moldy. Majority of the product is fine, and the mold was caught at our DC, but some product may have made it to PetSmart so we are recalling all the product at PetSmart and destroying all the product we have at our DC. You may contact JAKKS Pacific at 877-875-2557, Monday through Friday from 7:30 am to 5:00 pm PT. Kong can be reached at 303-216-2626. May 27, 2014 – Pet Center, Inc of Los Angeles, California has issued a voluntary recall for its Lamb Crunchy’s dog treats because it may be contaminated with Salmonella. Salmonella was detected by the State of Colorado, Department of Agriculture in a random sample. The FDA has confirmed this event in a recent news release. Salmonella can affect animals eating the products and there is a risk to humans from handling contaminated pet products, especially if they have not thoroughly washed their hands after having contact with the products or any surface exposed to these products. Pets with Salmonella infections may be lethargic and have diarrhea or bloody diarrhea, fever, and vomiting. Some pets will have only decreased appetite, fever and abdominal pain. Consumers who have purchased this product are urged to return them to the place of purchase for a full refund. Consumers with questions may contact the company at 800-390-0575 Monday through Friday between 7:30am through 4:00 pm PST. Just in time for the holidays, you can make a yummy treat for your dog! I will include recipe items for dogs with gluten allergies. 1 cup chicken broth (some broth contains wheat, so make sure you read the label, and make sure it is gluten free, or if you cook chicken for yourself, you can save the broth from cooking it). Whisk all your wet ingredients together until well combined. Add dry ingredients, one at a time, stirring between each addition to incorporate. Knead dough on floured surface for 2-3 minutes. Divide dough in half, make a well in one half and add the peppermint and food coloring-working it in and adding food coloring until desired color is reached. Place both dough rolls back into bowl, cover, and refrigerate for 1 hour to firm dough. Cover a cookie sheet in foil and spray with nonstick cooking spray. Whisk egg for wash in a small bowl. Remove dough from refrigerator, break each dough color up into an equal number of pieces- about a Tbsp. or so in size-depending on the size of the recipient. Roll each ball into a small snake-like shape. .Work on a long sheet of wax paper creating candy canes to prevent sticking- dough will still be somewhat sticky and that is normal. Twist one of each color together and bend the end to create a hook shape. Place your “Candy Cane” on the foil lined baking sheet. Brush each with egg wash. Cool completely and store in an airtight container. Keep in fridge for a week and if there are leftovers, freeze them in freezer bags for up to six months. With Thanksgiving here in the USA just a few weeks away, here is a great recipe where you can use up some of your leftovers and make treats for your pups. I have included gluten free ingredients for those pups with allergies. 1. Preheat oven to 350F and grease a muffin tin with olive oil or skip greasing and just line with paper cups. 2. In a medium bowl mix whole wheat flour (or rice flour) and baking powder then set aside. 3. In a large bowl mix cooked ground turkey (or other ground meat), cranberries, pumpkin puree, butter, milk and egg. 4. Once well combined add the flour mixture and stir until mixed. 5. Spoon cupcake batter into muffin tin until 1/2 full, flatten to fill the cups. 6. Bake for 20 minutes, until a toothpick inserted in the middle comes out clean. 7. Cool 5 minutes in pans then remove and place on wire racks to cool completely. If you want something extra special, top with a scoop of mashed potatoes and a sprinkling of parsley. Makes about 3 dozen cuppy-cakes. Store in the fridge in an airtight container for about a week. Freeze any leftovers and thaw as needed. 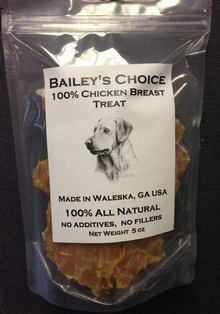 November 6, 2013 — Bailey’s Choice Dog Treats, LLC, of Waleska, Georgia is expanding its voluntary recall to include additional five-ounce packages of its chicken dog treats. According to an FDA news bulletin, the recall was announced by officials of the Georgia Department of Agriculture because of possible contamination of the treats with Salmonella bacteria. This recall announcement is a follow-up to our original story posted here on Friday, November 1, 2013. If you are in possession of one of the affected packages, officials recommend consumers discard the remaining contents. Have any leftover pumpkin? Here is a great recipe for some yummy treats for your dog! 1. Preheat oven to 350 degrees Fahrenheit. Line a flat baking tray with baking paper. 2. Peel and dice pumpkin into cubes and bring to boil in saucepan of water. Drain pumpkin and allow to cool. Puree in blender or food processor (or if you want to be old school, mash your pumpkin to a fine puree). Chill in refrigerator. 3. Combine flour, cinnamon and ginger in bowl and mix well. 4. Combine egg, honey and vegetable oil in large bowl and whisk until well combined. 5. Add the chilled pumpkin puree to the wet ingredients and whisk until well combined. 6. Slowly add the dry ingredients to the wet, whisking well until all ingredients are combined. 7. With teaspoons, spoon the batter onto the lined tray spacing about one inch apart to make mini cake patties. 8. Bake for 15 minutes. To test, insert a toothpick into the cake. If it comes out clean, the cake is ready and can be removed from the oven. Allow cakes to cool and serve. Makes approximately 30 pumpkin dog treats. Freeze any leftovers not consumed within several days. These treats are not real dog bones, but homemade with a yogurt topping. 1. Pre-heat oven to 350 degrees and spray the cookie pan lightly to prevent the bones from sticking. 2. Mix all of the ingredients together and knead dough until it forms a ball. 3. Take a small piece of dough and roll until it looks like a 6″ round line of dough, about the thickness of a marker. 4. Place the dough in the bone shaped cookie pan and press it into the shape of the bone. 6. Take out of the oven and allow the bones to cool. Don’t you just love the cracks? They make them look like real skeleton bones! 7. Mix 1 cup of non-fat plain yogurt with about ½ cup water. Mix well so that there are no lumps. 8. Place the cooled bones into the bowl with the yougurt “dip” and cover the entire bone. 9. Place the “dipped” bone on to wax paper. 10. Place bones in freezer until the yogurt dip is frozen. They were hard in about an hour.